As a transgender service member who spent the last five years fighting for open and authentic transgender military service, I have been dreading today. Being one of the lucky few who will not be kicked out of the military as the President’s trans ban takes effect, I am left wondering how I am expected to look my service members in the eye as this devastating policy is implemented. And how am I expected to handle the guilt of knowing that I am safe while thousands of my trans sisters and brothers, who are exactly where I was five years ago, are not. Recently, I found myself listening to the audiobook Radical Inclusion as I drove to base every morning. In the book, General Martin Dempsey recounts a story of looking for something to inspire teams of service members losing peers during the Iraq war that showed empathy to their trauma. While I understand this situation is not the same as losing someone in battle, we are still fighting for our lives. We are still facing a situation where, despite our best efforts, we will not be able to save everyone. As one of the lucky few allowed to stay, now is the time we will be looked to become the face of open transgender service. Us who are able to wiggle our way through narrow exemptions for trans people to serve, a group that’s less than 2,000 people, and will be looked at to ensure our work doesn’t lead to even harsher policies that will erase us even more. And we must make it matter so that the brief moment we had that allowed us to serve as openly trans — no matter where we were in our own transitions — can return. This situation is temporary, and can be reversed if we change things in Washington D.C. So while it may seem dire, and is very much catastrophic to the many people now laid off, the moral arc of the universe ultimately bends towards justice. In the meantime, to those who may not understand its importance, make it matter. Within the 24-hour news cycle, it will be easy for this issue to get lost in the darkness. So, I implore allies and partners in the community to continue to make transgender service members matter. We refuse to leave anyone behind. We will not hide. We, who just happen to be transgender, will continue to serve with honor and dignity, just as those who have served before us, knowing that our service will affect those who will seek to serve in the future. We must make it matter. Putting on the cloth of this country is more than just a job. It is a calling — a calling to serve something greater than ourselves. And now as one of the last remaining trans service members, I will serve as a reminder that no matter what policies they implement, we, as trans people, cannot be erased. 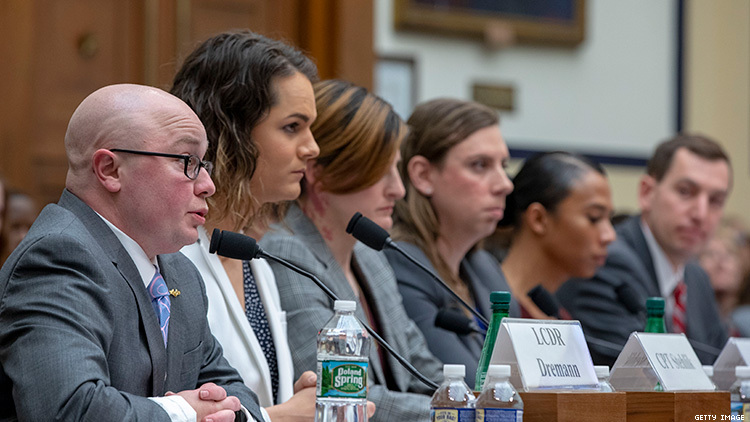 Blake Dremann is an active duty Naval Supply Officer, who just happens to be transgender. He has deployed 11 times both overseas, on surface ships and submarines. He is also President of SPARTA, a transgender military advocacy organization. His views expressed here are his own and do not reflect the views of the Department of Defense or the Navy.